Astrophysicist Barbie was developed by Mattel and National Geographic to inspire kids to pursue STEM fields. NEW YORK — The iconic doll Barbie will look to the heavens as an astrophysicist and astronaut this year in an effort by toy-maker Mattel to inspire young girls into STEM fields. Since Barbie first launched in 1959, encouraging girls to dream big has always been a goal of the company, a Mattel representative told Space.com here at Toy Fair 2019. With Barbie’s 60th birthday coming up in 2019, the brand wanted to recreate several of the doll’s most successful careers, including an iconic astronaut design. "Barbie took her first spacewalk in 1965 and has been shooting for the stars ever since,"reads the back of the new Barbie's packaging. The first astronaut Barbie was named "Miss Astronaut." The doll was redesigned in 1985, 1994, 1998, and 2016, with her spacesuit changing in each incarnation— sometimes not-so-realistic, like the '80s doll who wore a pink and silver mini-skirt spacesuit with sparkly tights, and sometimes more realistic like when Mattel collaborated with NASA on a Mars Explorer doll in 2013. More recently, Mattel has released an Astronaut and Space Scientist in a two-pack. The new Barbie Career 60th Anniversary Astronaut is already available and retails for $9.99. She comes with a white space suit decorated with pockets, wires, and monitors in blue and pink, as well as a white space helmet, gloves, and shoes. "In celebration of her long career in space, she takes off on a new adventure, planting a flag for girls all over the world," the box reads. In Fall 2019, Mattel will release Astrophysicist Barbie as part of a collaboration with National Geographic aimed at inspiring kids into STEM subjects. The doll will retail for $14.99. Astrophysicist Barbie is one of five different careers developed by Mattel with National Geographic. The others are: a Wildlife Conservationist, a Polar Marine Biologist, a Wildlife Photojournalist and an Entomologist. To celebrate Barbie's 60th anniversary in 2019, Mattel is also releasing a released a new Barbie Careers Astronaut doll for $9.99. The new Astronaut Barbie is one of six iconic careers celebrating the Mattel toy line. The other careers featured are: Pilot, Athlete, Journalist, Political Candidate and Firefighter. They are all scheduled for release this spring. But the new astronaut Barbie isn’t the only one going on space adventures this year. Mattel has collaborated with National Geographic to create a line of STEM career Barbies, including an astrophysicist. This line of Barbie dolls was specifically focused on science occupations in which women are underrepresented. Among the line are: a Wildlife Conservationist, a Polar Marine Biologist, a Wildlife Photojournalist, an Entomologist, as well as the Astrophysicist. Each doll was developed with the help of a National Geographic advisory team made up of female National Geographic Explorers and National Geographic magazine editor-in-chief Susan Goldberg. The advisory team helped Mattel create accessories that are relevant for each Barbie’s career. 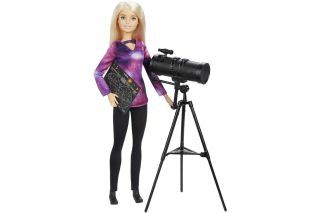 Astrophysicist Barbie, for example, comes with a telescope, a star chart, and a fun nebula-printed shirt (like you'd likely find in the closet of a a real-life astrophysicist). "Helping people understand the world is, and always has been, the core purpose of National Geographic," Goldberg said in press release. "Through our partnership with Barbie, we are excited to reach kids in a new way, using the power of play to inspire our next generation of explorers, scientists and photographers." Astrophysicist Barbie will be available in the fall and retails for $14.99. Follow Kasandra Brabaw on Twitter @KassieBrabaw. Follow us @Spacedotcom and Facebook.